A complete range of Datexx TimeCube timers improve student productivity and focus. And grades! KENILWORTH, NJ (DATE) – With the school year upon us, parents across the country are looking for ways to keep their kids on the path to academic achievement. Experts agree that time management is one of the keys to success. And a new tool from the innovative engineering team at Datexx is making that happen for families and students across the country. The TimeCube is set by simply rotating it to the desired time, so there’s no need to fuss around adjusting a knob. It comes in 10 different colors with various timer options appropriate for students at any grade level. Even children who know how to tell time don’t necessarily know how to measure time. Setting a timer during a block of time when they’re supposed to be completing a task has proven to be a really helpful strategy. “Who knew that a timer could be fun enough to encourage kids to do their homework,” gushed Carolyn Levine from Houston. Parents can also keep a clock nearby and give kids a verbal countdown as the minutes tick by so that children can begin getting an internal feel for these time segments. Today’s families are busier than ever and kids are bombarded with distractions every minute of every day. So developing time management skills has become increasingly important. Of course, no tool will be beneficial if it ends up getting tossed into a drawer and forgotten. Because the TimeCube is easy to use and attractive, it’s certain not to meet that fate. “I bought these for everyone in the family as I thought they are great example of how good design can make life simpler,” said San Diego mom Denise Bynum. Datexx by Teledex is a proud family-owned company founded in 1990 in New Jersey, USA. We are an innovative consumer electronics company that has been developing and marketing attractive, high-quality products worldwide for over two decades and with over 20 million satisfied customers. Training and coaching is dramatically improved with the TimeCube® Plus. No more excuses for running overtime. Even more, the TimeCube® makes it fun and interactive – helping you stick to your training and coaching time slot. Check out our latest catalog for more information. Our brand new TimeCube Plus is still the easiest tool to help keep classrooms running smoothly. Check out the new video on our site to see how it works! Check them out next week at the ECRM Educational Show in GA! We have a new addition to the TimeCube family. Introducing the TimeCube Plus series with added features and functionalities including countdown pause and a quiet alarm, as requested by our biggest TimeCube fans! The timers are an instrumental piece to my classroom. I use them on a daily basis. I use them to time the students doing their warm-ups, picking up from the day, or packing up at the end of the day. I also use the timers for stations, the timers let the students know when it is time to move on to the next activity. This helps keep the classroom running smoothly and making sure that we are utilizing every available minute and that we are not running over our given time. The timers are also used for “additional time” – if we are working on something and the students need a couple extra minutes, we use the timer to keep time. The longer minute timers are for an entire class period – if they have an assignment that will take the entire time, I can use the 45 minute timer so the students can physically see how much time is left at a quick glance. I LOVE these timer because they give us great increments and I’m not having to have my phone out or use stop watches – it is a very easy way to readily give a couple minutes and several minutes. Also, the kids love the look of the timer, they think they are super fun! They “fight” over who gets to flip the timers when they go off. A back to school forecast from you would be helpful to ensure that your orders are prioritized. Please kindly inform if you need product data or samples to make your BTS decisions. Datexx best sellers for Back to School are in! From scientific calculators that have better value compared to TI, to TrackBack Calculators that allow for review and editing, and even hands-free timers for studying and homework! Get ready for Back to School season with Datexx! 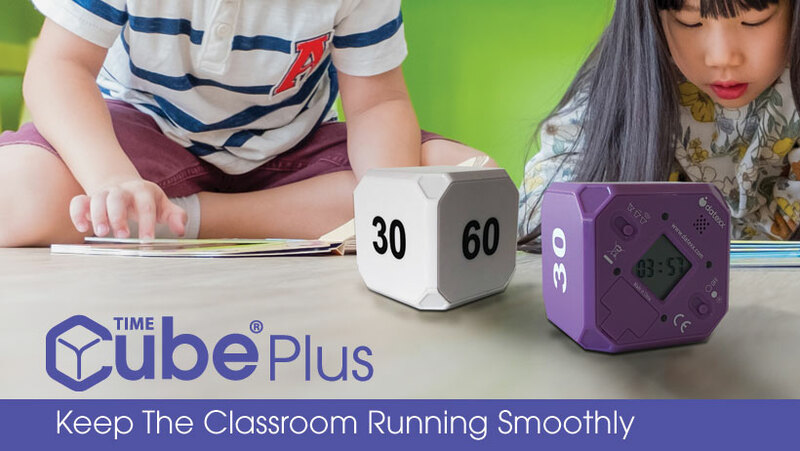 Our TimeCubes® are a hit with teachers, schools, parents, and children of all ages. The cubes not only help teachers run their classrooms smoothly, but they also begin to teach children the important skill of time management in a fun and effective manner. The TimeCube® is the world’s simplest timer and is highly rated at 4.1 stars, with over 1,200 reviews on Amazon with controlled MAP pricing. They are also available through School Specialty, Educational Resources, Kurtz Brothers, ICM, and more! Training is more productive with the TimeCube® Plus. No more dragging, no more running overtime. 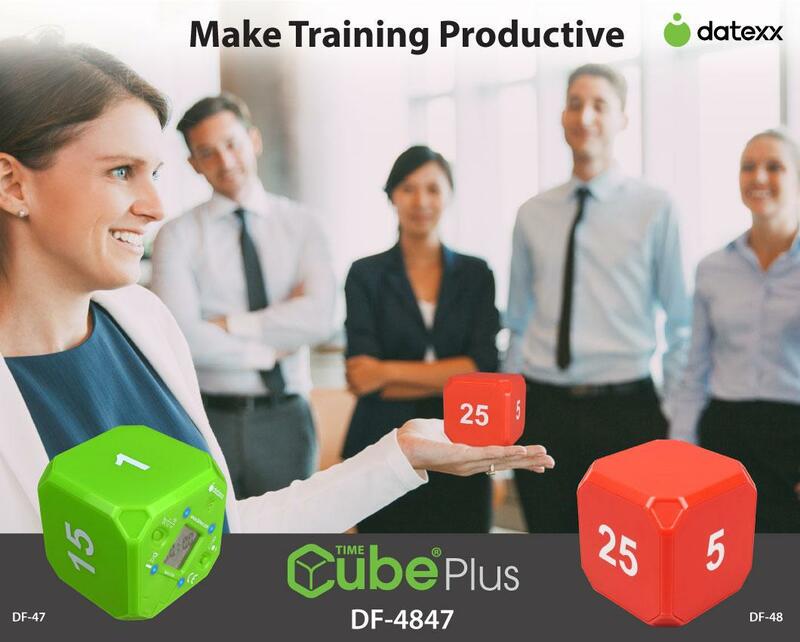 Let the TimeCube® Plus help you stick to your training plan… and help avoid losing your trainees’ attention span! Datexx’s TimeCube® Plus Featured in Premium Incentive Magazine! 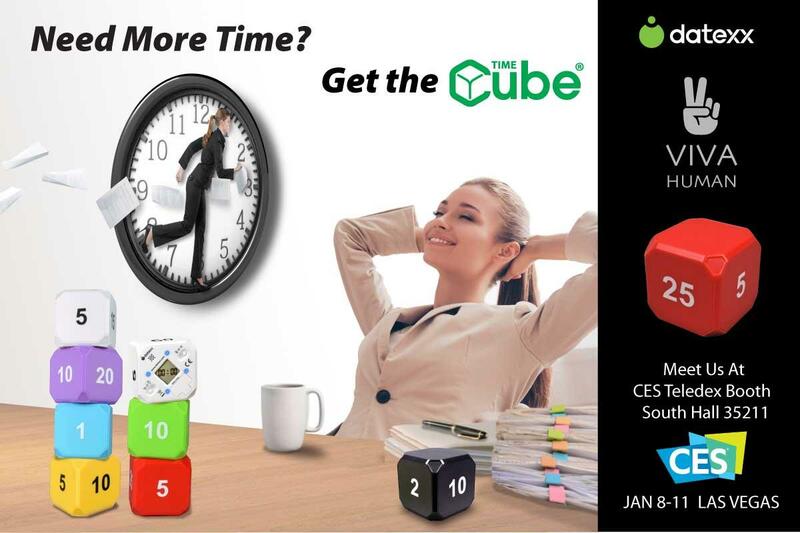 Our brand new TimeCube® Plus has been featured in Premium Incentive magazine! The TimeCube® Plus is the ultimate time machine, and is the easiest tool to help people keep their lives on track and get things done! It’s all about increased productivity through simple solutions! Visit us at the upcoming Consumer Electronics Show in Las Vegas from Jan 8-11, 2019 at South Hall 35211. We’ll be introducing Viva Human, our new initiative that focuses on helping people increase their wellness and productivity by simplifying their lives. We’re providing ways to keep people’s hectic lives running smoothly – thus reducing stress and improving overall health in the new year and beyond! For more information about the initiative, take a look at our Powerpoint, Catalog, YouTube, and Site. And check out what our customers say about us at our Datexx Blog. KENILWORTH, NJ (DATE) – At CES – the annual homage to Artificial Intelligence – Datexx remains committed to helping customers increase their Human Intelligence. Long known as a technology dynamo for creating a range of products designed to make life easier, Datexx continues its tradition as a disrupter by introducing ‘Viva Human’, an initiative that focuses on helping people increase their wellness and productivity by simplifying their lives. Looking for ways to keep their hectic lives running smoothly – thus reducing stress and improving overall health – people have discovered what the experts have known all along: time management is a critical key to success. And the little TimeCube® Plus is making that happen in a big way. In fact, people have come to think of the TimeCube® Plus as the ultimate time machine because it has the power to increase the number of productive hours in each day. The TimeCube® Plus is set by simply rotating it to the desired time, so there’s no need to fuss around adjusting a knob. It comes in eight different colors with various timer options appropriate for work, school and home. This nifty little timer is perfect for improving performance at the office. “Instead of trying to do everything at once, the TimeCube® Plus lets me focus on one thing at a time for a set amount of time,” said HR Manager Carolyn Levine. “That way I can get everything done without worrying that something’s fallen through the cracks.” In fact, devotees of popular time management systems love the TimeCube® Plus for its ease of use. The TimeCube® Plus has become the darling of the healthcare industry, where it’s used in patient care, in the scrub room, in the lab, and in therapy sessions. Retailers across the spectrum also love how the TimeCube® Plus enhances their offerings of kitchen and lifestyle products, exercise equipment, educational supplies and much more. Of course, no tool will be beneficial if it ends up getting tossed into a drawer and forgotten. Because the TimeCube® Plus is as attractive as it is easy to use, it’s certain not to meet that fate. “I bought these for everyone in the family as I thought they are great example of how good design can make life simpler,” said TimeCube® enthusiast Denise Bynum. Datexx by Teledex is a proud family-owned company founded in 1990 in New Jersey, USA. This innovative consumer electronics company has been developing and marketing attractive, high-quality products worldwide for over two decades and boasts more than 20 million satisfied customers. Datexx World Headquarters are located at 1 Atlas Street in Kenilworth, NJ. For additional information about the TimeCube Plus and Datexx’s other innovative products, contact Mei Noguchi at sales@datexx.com or by calling 908-964-8109. Hot off the press! Datexx TimeCubes® were featured in the recent issue of Educational Dealer Magazine. Datexx’s complete range of TimeCube® timers help improve children’s time management, productivity and focus. Just turn it and learn!